European Parliament president Antonio Tajani delivers a speech during the Princess of Asturias Awards ceremony at the Campoamor Theatre in Oviedo, Spain on October 20, 2017. 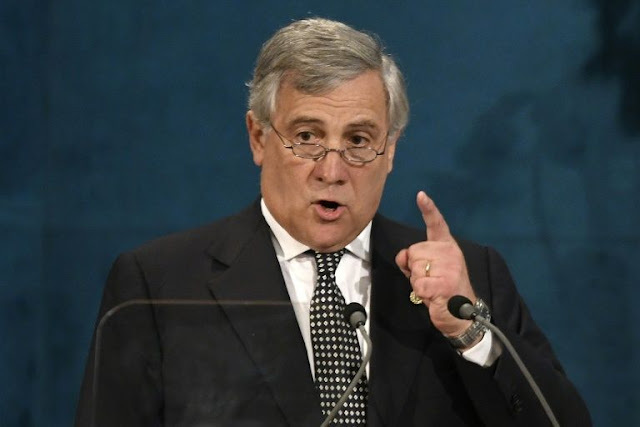 Rome - European Parliament chief Antonio Tajani said Europe should "fear" the spread of small nations as Spain struggled Sunday with the Catalonia crisis and the Italian regions of Lombardy and Veneto voted in referendums on greater autonomy. Lombardy sends 54 billion euros ($64 billion) more in taxes to Rome than it gets back in public spending. Veneto's net contribution is 15.5 billion. The two regions would like to roughly halve those contributions -- a concession the cash-strapped state, labouring under a mountain of debt, can ill afford. They also want new ones relating to security issues and immigration -- steps which would require changes to the constitution. Polls in the two regions opened at 7am (0500 GMT) and close at 2100 GMT. European Parliament chief Antonio Tajani said Europe should "fear" the spread of small nations as Spain struggled Sunday with the Catalonia crisis and the Italian regions of Lombardy and Veneto voted in referendums on greater autonomy. In an interview with the Rome daily Il Messaggero, the Italian politician said Europe must "of course fear" the proliferation of small nations.